If you’d like to feel like royalty (and which of us wouldn’t! ), check into the exquisite Goldmoor Inn, a spacious bed and breakfast reigning over the bluffs of the Mississippi River, just outside of Galena, Illinois. Once a private residence, the home was transformed three decades ago into an elegant Inn, surrounded by dense woods and glorious gardens, including an English Rose Garden that is at its height in early summer. The Inn offers 13 suites, plus two log cabins, and three cottages, each luxuriously furnished and featuring extras such as baths with two-person whirlpools, heated towel bars and plush robes, fireplaces, in-room cookies, and breakfast delivered to your room. All the makings of a pampered stay. Spend the day exploring the Galena area, which offers excellent shopping, a wealth of wineries, and great outdoor activities—hiking, golf, horse-back riding and more. Then return to dine in Goldmoor Inn’s elegant restaurant, with views of rolling hills and the mighty Mississippi, and a menu that features seasonal dishes as well as classics such as Beef Wellington. For a special treat, book the Chef’s Table and dine inside the kitchen, chatting with the chefs as they cook. Guests can also take advantage of the Goldmoor Inn Spa, which features a full menu of individual or side-by-side massage treatments. It’s easy to see why Goldmoor Inn is a top wedding and honeymoon venue. The fairy tale setting, complete with an outdoor Pavilion, is tailor made for happy ever-afters. The Inn offers several packages, such as its new golf and zipline tours, and a hard-to-pass up Tuesday special: Stay any three nights, including a Tuesday, and the Tuesday is free. 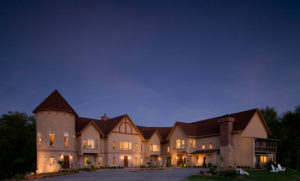 Goldmoor Inn is a member of the Illinois Bed and Breakfast Association. Expect a wonderful stay at any of our member inns! Photos courtesy of Goldmoor Inn. This entry was posted in Illinois Bed and Breakfasts and tagged Galena, Illinois Bed & Breakfasts by admin. Bookmark the permalink.